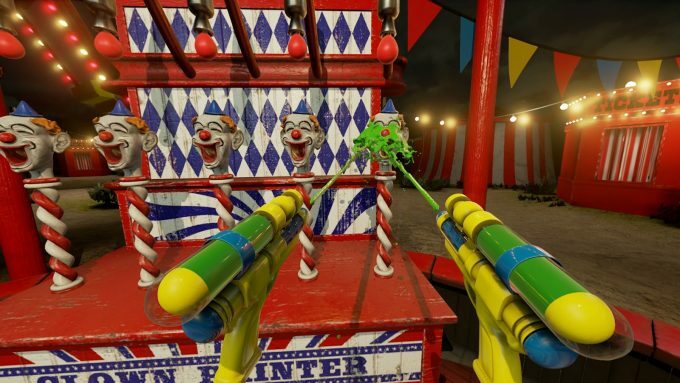 NVIDIA’s VR Funhouse is a bit special for a couple of reasons. First, it proves to be an amazing tech demo for both VR and game physics, and second, it’s NVIDIA’s first-ever full-fledged game, available right now on Steam. If you love popping balloons and drowning clowns with green ooze, this game is for you. We’re only a few months into the virtual reality war and its impact on the industry has already been felt. With two primary players in the VR space, the hardware needed to drive both the Vive and Rift is as important as the headsets themselves. To meet this requirement, AMD and NVIDIA both have invested heavily in hardware that push what can be made possible in VR. That said, the most powerful hardware available is useless if there isn’t quality software. Thankfully, we have some sterling options available, and today, that list grows by one. It’s been no secret that NVIDIA is investing a tremendous amount of man hours and capital in fueling the VR experience. Those looking for background on this can read Jamie’s great write-up on the GeForce GTX 1080 and 1070 launch a couple of months ago. 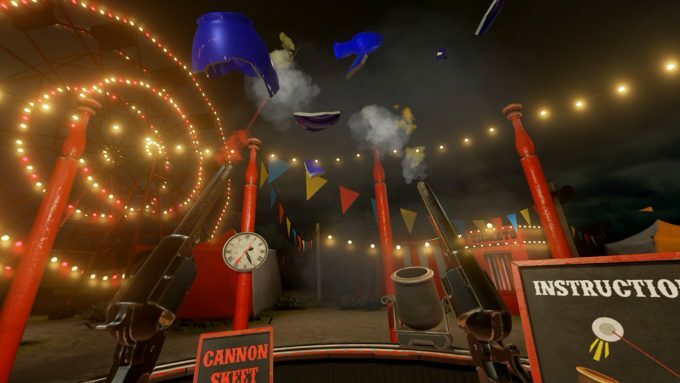 To further aid in the adoption of VR headsets and the PC hardware that drives them, the Santa Clara based technology company has released its first ever published video game, called VR Funhouse. 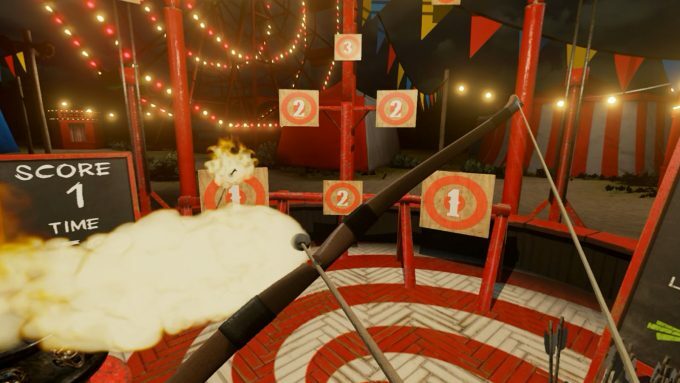 VR Funhouse, like Valve’s highly entertaining The Lab, is a collection of mini games and is intended to both amuse and showcase what is possible with NVIDIA Pascal-powered VR. 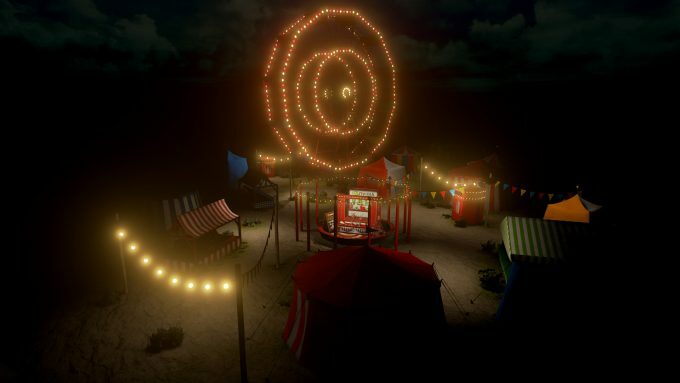 With games that showcase PhysX, particle interaction, fluid dynamics, haptics and realistic inertia, VR Funhouse is open source and now available to anyone with a Steam account for free. Let’s take this VR Funhouse for a spin. 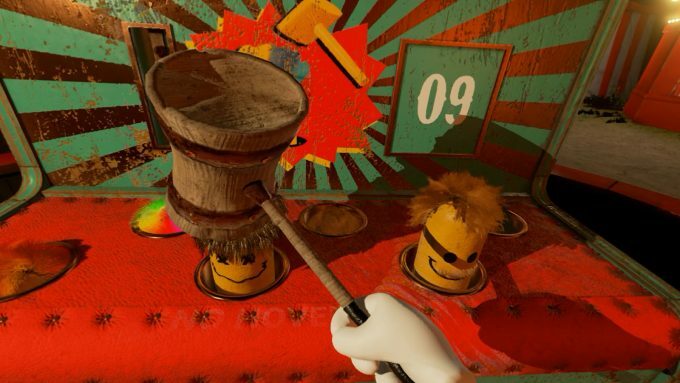 Once in VR Funhouse, you are placed in front of a table that has a few baseballs, a bat and a large mallet. The first thing I noticed when the curtains open up to show a book case full of plates and statues waiting to be destroyed, was the incredibly realistic fabric motions. This isn’t anything new. Like the physics associated with fluids, fabric is something that NVIDIA has done a great job digitally representing over the years. One of the first times I had ever been truly amazed by realistic fabric movements was at the 2006 GDC, where AGEIA was showing off the Cell Factor demo. In it, banners were convincingly ripped and obeyed the laws of gravity as they fell. When NVIDIA acquired AGEIA, all that impressive technology was theirs to improve upon. Back to the funhouse. After the curtains open and you’ve had a chance to break a few plates, you can look to your left for instructions and to the right for a button. Who can resist pushing a button when they see one? Anyway, by pushing the button you are presented with options of low, medium and high settings, with GTX 1060, 1070 and 1080 assigned respectively. I’m happy to report that the pair of GTX 970s were more than capable of giving us an enjoyable and impressive experience. The Intel i7-5960X likely helped with performance as well. This is a simple one. You begin in a ring, surrounded by machines that continuously blow up balloons. As they are inflated, you whack them with the pair of swords you have, one in each hand. To pop the balloons, you have to swing in earnest, as a tap won’t cause them to burst. You can almost feel the surface tension on each balloon as your sword is pressed into the virtual latex. If you stab or swing hard enough, each balloon will burst into a shower of confetti. It’s the confetti that truly showcases what can be done with NVIDIA Flow. Flow gives the air mass, and as you swing the sword through the confetti, the particles are affected realistically. Swiftly move the sword through the cloud of particles and a vacuum is formed on the trailing edge of the blade, causing the confetti to circle around and follow the blade as it moves across the screen. This was the mini-game I was most excited for. As an avid shooter, VR offers a far more realistic shooting experience than a standard video game. In this one, a cannon fires random objects in an arc toward you and it’s your job to shoot those objects before they hit the ground. 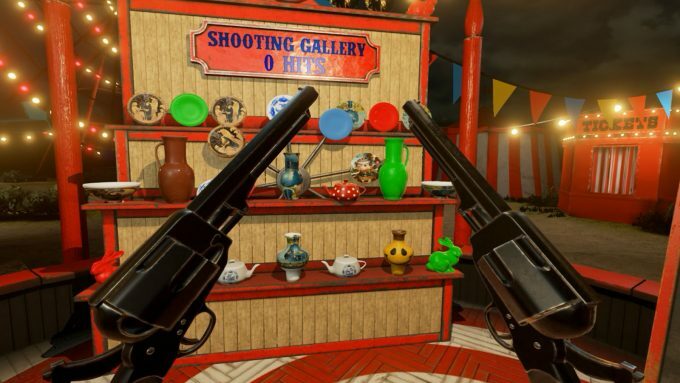 With any shooting VR game, it’s easy to forget that you have a pistol in your non-dominant hand so it’s important to remember that you are dual wielding. Tear it up. The most exciting thing about this game is the physics of the falling objects. As you hit them, they shatter, but inertia carries the shards in an almost believable pattern. Should you miss, they break upon hitting the ground. While firing, realistic smoke leaves the barrel of the pistols, adding to the overall effect of the game. Clown Painter wasn’t something I was looking forward to but turned out to be very surprising. This was the most technically impressive game of all that we played and it had everything to do with liquids. Liquids have always been something that NVIDIA has handled well. Clown Painter, like the other games in the Funhouse, is a call back to carnival games of many of our childhoods. It’s a game where a water gun is used shoot into a clown’s mouth, which in turn, blows up a balloon. The first balloon to burst is the winner. Only the water is green slime. Details. NVIDIA FleX is the driving force behind the hyper realistic liquids. To quote NVIDIA: FleX is a particle based simulation technique for real-time visual effects. The green liquid can be shot straight up in the air, and the more you squeeze the controller’s triggers, the harder the flow of liquid. As you shoot straight up, you can back off the trigger so the flow of liquid is slowed down. This creates a realistic geyser of liquid that behaves as one would expect in the real world. When the streams are crossed (never cross streams), they interact exactly how one would expect them to if they had two hoses in their back yard. Fire Archer is very similar to the archery game found in The Lab. There is very little to this demo beyond realistic, volumetric, fire effects and a good use of haptic feedback from the Vive’s controllers. As you notch your arrow and pull back, slight vibration in the controllers give a good simulation of tension as the bow is drawn My only complaint/suggestion is to allow the bow to be dropped and picked up with the opposite hand. As a lefty, I didn’t mind swapping the controllers in each hand, but I also think it could have easily been done before release. It’s not a carnival without punching something, ammirite? With Mole Boxing, a group of “moles” come towards you and you have to land punches to send them back where they came from. This is a fairly mindless game but it does showcase a couple of neat features. First off, the hair on the moles is fantastic. Using NVIDIA’s HairWorks to give the mole’s hair realistic movement. Another touch of realism is the force it takes to move one of the mole’s backwards. A slight smack won’t get them out of your face. It takes a strong punch to do that. The shooting gallery was always my favorite carnival attraction growing up. Armed with a pellet fun, I spent hours trying to pop enough balloons to win a prize. I never cared what I won, only that I won. In this game, there are multiple targets to attack, each breaking in unique and realistic ways. PhysX makes this all possible. As a spinning target is hit, the shards of what was once a plate continue to move in realistic motions in a direction similar to how the target would spin had it not been hit. Another thing to try is shooting the planks on the gallery itself. They will break as one would expect after shooting it with a pistol. The final game is Whack a Mole. This game is another great example of what is possible with character hair when the proper technology is implemented. As the moles pop up, their hair moves up with them. When they stop, inertia continues to carry the hair upward until it stops and falls back down on onto the head. We are one step closer to virtualizing Donald Trump’s luxurious hair. While NVIDIA calls the VR Funhouse a video game, I’m more inclined to refer to it as a tech demo. I suppose it could be both, but there is quite a bit of replay value that is missing. A few games, like Fire Archer and the two shooting based ones are really the only games that have any replay value at all. That said, it’s difficult to ignore the excitement you feel as you pop a balloon or shoot a plate for the first time. 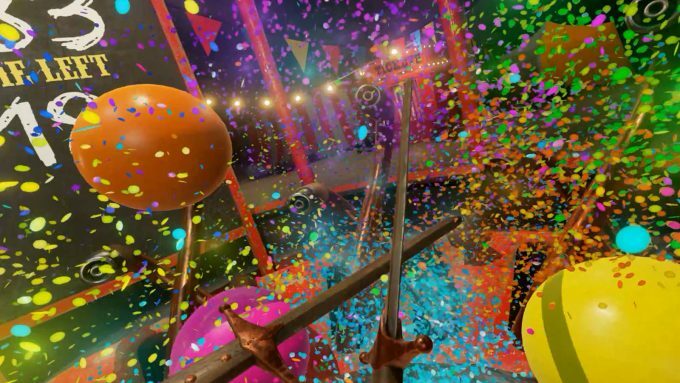 It’s games like VR Funhouse that are so important to emerging technologies like VR. It helps to lay the foundation of what games can be and it shows them how they can get there. VR is an experience and the Funhouse is no different. 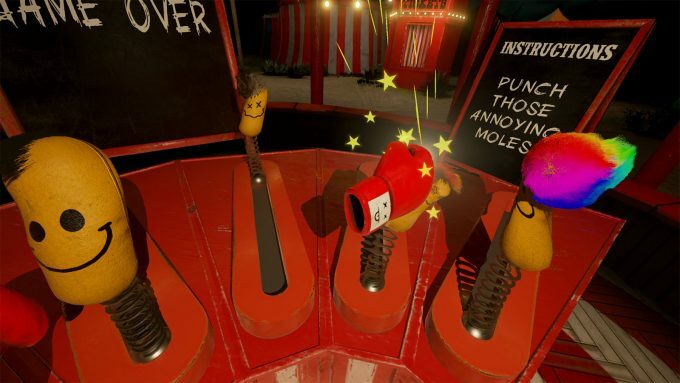 Valve’s The Lab is still the benchmark on sandbox style games, but with VR Funhouse free to download, you owe it to yourself to grab it and spend an hour destroying everything you come across at the carnival.